To evaluate the potential of barley for the phytoremediation of soils contaminated by metals, we conducted a growth chamber experiment with plants exposed to various concentrations of Zn, Cd and Cr. Growth parameters, chlorophyll content and chlorophyll fluorescence were measured at 15 and 29 days after treatment application, and the metal concentration in the aerial part of the plant, the root and the soil was also measured. In all cases, the amount of metal accumulated in the plant increased by increasing the concentration of the applied metal, and the roots accumulated more metal than did the aerial part of the plant. The amount of Cr found in the soil was significantly lower than that of Cd and Zn. The toxic effect of Zn and Cd on the plant was low, affecting growth only at the highest concentrations. For Zn and Cd at the concentrations used, the decrease in water content was 14% compared with the control and 26% for Cr. For plants treated with the highest metal concentrations, the most significant differences were found in chlorophyll content, which had the lowest values compared with the control (23% for Zn, and 42% for Cd and Cr), and in chlorophyll fluorescence (2% for Zn, 23% for Cd and 29% for Cr). These decreases occurred 29 days after applying the Zn and Cd treatments. In plants treated with Cr, the decrease occurred 15 days after treatment application. 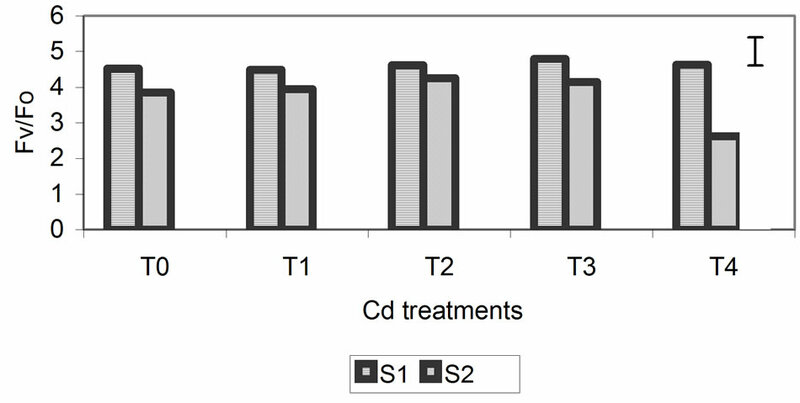 Under our experimental conditions, barley is more tolerant to Zn and Cd than to Cr. Heavy metal contamination of soils is a serious environmental problem because excessive metal concentrations pose risks to the health of humans, animals and plants. Certain metals are necessary for the growth and development of plants, but a number of these metals are highly toxic at high concentrations, resulting in growth inhibition and toxicity symptoms. Metals and metalloids are toxic elements naturally present in the soil or added to the soil through various anthropogenic activities. Important sources of these elements include atmospheric deposition from mining activities, phosphate fertilizer and manure, sewage, urban compost and industrial sludge . Due to the high persistence and potential toxicity of metals, soils contaminated with these elements are an environmental problem that requires effective and affordable solutions . In this sense, phytoextraction, proposed by Chaney , is a viable technology for cleaning contaminated soils that has received increased consideration by scientists in recent years. The phytoextraction of metals in contaminated soils is based on the use of plants that can extract and translocate the metals to harvestable parts. The success of the extraction process depends on the ability of the selected plants to grow and accumulate metals under the specific climate and soil conditions of the site requiring remediation. The ability to hyperaccumulate metals is a relatively rare phenomenon in the plant kingdom, and the relationship between tolerance and hyperaccumulation is still under debate. In at least a portion of cases, however, increased tolerance leads to the increased accumulation of metals [2,4,5]. Plants can use two strategies to deal with high concentrations of metals adjacent to their roots: 1) exclusion mechanisms that restrict the entry and/or transport of metals from root to stem and 2) internal tolerance mechanisms that immobilize, compartmentalize or detoxify metals in the symplast through the production of compounds that bind the metals. The exclusion of metals from the root is the most common strategy used by metal-tolerant plant species . Tolerant plants can accumulate metals in stem biomass without reducing or displaying symptoms of toxicity. Inevitably, metal hyperaccumulation is associated with a strong capability to increase the detoxification of the metal accumulated in aerial tissues, which are known as metal hypertolerance . Hypertolerance is a type of resistance to an extreme abiotic stress. Plants have cellular mechanisms involved in heavy metal detoxification and tolerance to stress produced by metals . In some cases, the ability to accumulate metals is more related to tolerance than to hyperaccumulation, indicating that tolerance to metals may be the best criterion to obtain lines with greater phytoremediation potential . An increased knowledge of plant tolerance to metals will be essential in developing strategies for the genetic improvement of the capacity of a plant to accumulate metals. Such improvements will have significant implications for phytoextraction. Most known hyperaccumulator species are grow slowly and have low biomass. Therefore, obtaining plants that can accumulate metals, grow rapidly and have increased biomass is a promising method to obtain plants for phytoremediation. Natural variation exists in the input and distribution of trace elements among crop species and among cultivars within species. This variation may be responsible for trace element deficiencies and toxicities, which can affect food quality ; examples include genetic variation in Cd concentrations in wheat and rice [10,11] and QTLs associated with Cd and Zn concentrations in rice . Zinc is an essential micronutrient for plants. Zinc increases productivity and growth and plays a catalytic and/or structural role in many physiological processes of the cell [13,14]. Zn is, however, phytotoxic at high concentrations and can induce oxidative stress of cellular components and alter antioxidant systems [15,16]. This metal is easily assimilated by plants growing in contaminated soils, exceeding the amounts necessary for plant nutrition. Plants affected by excess Zn may show symptoms similar to those of other heavy metals toxicities, including the inhibition of root growth, generation of reactive oxygen species, induction of chlorosis in young leaves and deficiency of other essential elements . The mechanisms controlling Zn homeostasis in plants are, however, not fully known. The presence of Cd in soil is of growing concern, due to its accumulation in the food chain and in crop production. Although this metal is not essential for plant nutrition, it can easily enter plants through the roots and accumulate in vegetative and reproductive organs. Natural variability exists in the input and distribution of Cd in crop species  and in cultivars within species . Cd accumulation also differs between organs or tissues in the same plant [18,19]. Once absorbed by plants, Cd can negatively affect various cellular processes, leading to a reduction in plant growth, chlorosis of the leaves and increased leaf senescence [5,20]. These visible symptoms reflect changes in the biochemical components of plants and in metabolic pathways, such as a decline in the photosynthetic rate . Crops grown in contaminated soils may contain high concentrations of metals in edible portions, leading to the risk of chronic toxicity if ingested in excessive amounts. Cr contamination of soil and water is one of the most serious environmental threats, resulting in the loss of crop yields and undesirable health effects when pollutants enter the food chain. Cr occurs in several oxidative states; the most stable and common states observed in the environment are the trivalent and hexavalent states. Both forms seriously damage plant tissues and organs, although Cr (VI) is more toxic to living organisms [22,23]. Cr interferes with several metabolic processes, causing toxicity to plants, which results in reduced growth, leaf chlorosis, inhibition of photosynthesis and ultimately plant death [24-26]. The objective of this study was to evaluate the effects of increasing concentrations of Cd, Cr and Zn on physiological parameters and the growth of barley plants. Barley 6-rowed cultivar CB502 was used as the vegetative material. In October 2010, 45 half-liter pots were planted with two barley seeds in each pot. Soil with sand was used as the substrate (2:1). The plants were grown in a growth chamber with a photoperiod of 16 hours of light and 8 hours of dark. The chamber temperature was 23˚C during the day and 12˚C at night and maintained a relative humidity of 40% and 80% during the day and night, respectively. The pots were watered with tap water until plants reached stage 20 on the Zadoks scale . The pots were subsequently divided into three groups of fifteen pots each. Each group was irrigated with solutions with different concentrations of Zn, Cd and Cr. Five treatments per group were applied with three pots per treatment. T0 corresponds to the control pots, which were watered with 55 ml of tap water. The pots with the metal treatments (T1 - T4) were watered with 30 ml of tap water + 25 ml of the corresponding metal solution prepared from ZnSO4·7H2O; CdCl2·5H2O or K2Cr2O7. The plants were watered three times per week. Plant height was measured at the beginning of the experiment (S0) and after 15 (S1) and 29 days (S2) of treatment. At the end of the experiment, the plants were cut at ground level and were individually weighed to obtain the fresh weight of the stem. The plants were subsequently dried in an oven at 80˚C for 48 hours and were weighed to obtain the dry weight. Once washed, the roots of each plant were dried in the oven to obtain the root dry weight. RWC = (FW – DW) × 100/FW where RWC = relative water content, FW = fresh weight and DW = dry weight. Metals in the stems and roots were extracted after acid digestion of the ashes according to the methodology described in MAPA (2004). Metals in the soil were extracted in an acidic medium using a microwave extraction system (Multiwave 3000, Anton Paar GmbH, Graz, Austria). Determination of the metals in the corresponding extracts was conducted by atomic absorption (Varian AA 240 FS, Varian, Palo Alto, CA). Estimates of chlorophyll content were determined from intact leaves using a portable SPAD-502 (Minolta, Ltd., Osaka, Japan). The measurements were made at 15 (S1) and 29 days (S2) after treatment, on the fourth leaf of the main stem of each plant. Four measurements were made per plant, and the mean value of each leaf was calculated (ten values per treatment). The chlorophyll concentration was estimated from the following equation: Cl (mg·m–2) = 15.68 (SPAD value) – 209.03 . Chlorophyll fluorescence was measured at 15 (S1) and 29 days (S2) after metal treatment using a fluorimeter F MS2 (Hansatech Instruments Ltd., Norfolk, UK). For each plant, the fluorescence was measured in the central part of the fourth leaf of the main stem (ten measurements per treatment) after adaptation to darkness for 30 minutes. The data were analyzed using SAS for the analysis of variance. Means among treatments were compared using Duncan’s test or LSD values. 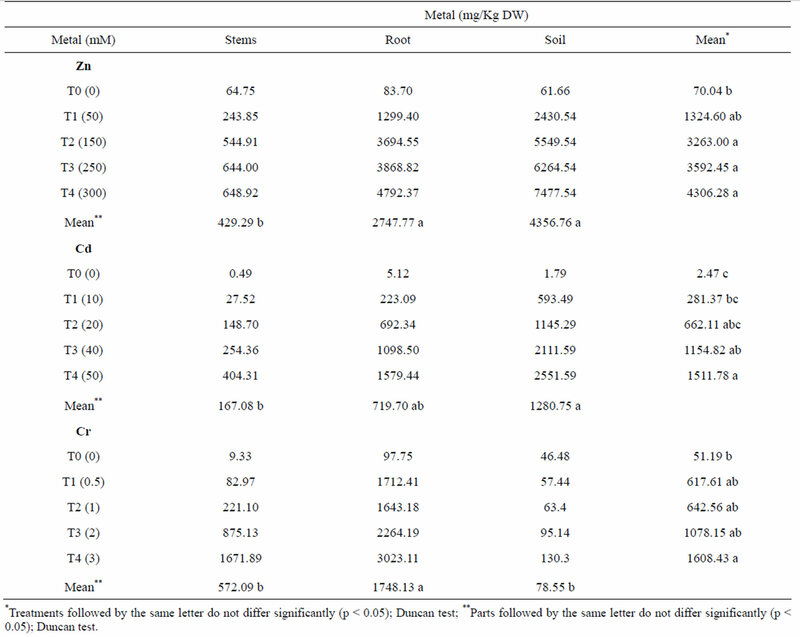 Plant height for all treatments was similar at the beginning of the study, as shown by the data for S0 in Table 1. The plants that were treated with solutions of different concentrations of Zn and Cd continued to grow for 29 days (S2), and the average height at S2 was significantly greater than at the beginning of the study and after 15 days of irrigation with metal solutions. In terms of treatment averages, only the height of the T4 Cd treatment was significantly lower than that of the other treatments. 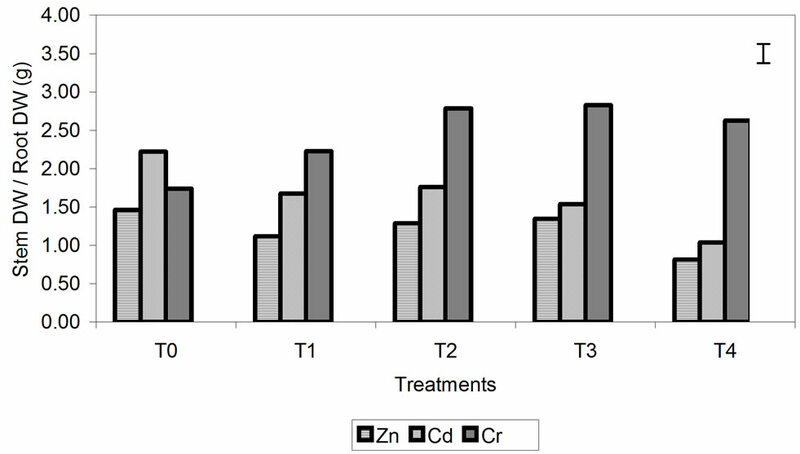 Plants treated for 29 days with different concentrations of Zn grew more (17% - 25%) than the control plants (13%). In the Cd treatment, control plant growth for this period was 18%, which was somewhat higher than that of the treatments, which was between 17% and 11%, with the latter corresponding to T4. When the Cr treatments were started, plant height was similar in all treatments, except for the control plants, which exhibited a lower height. 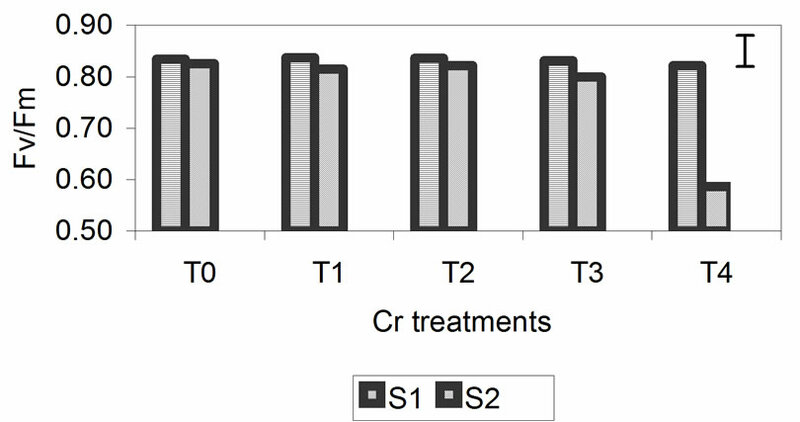 The plants continued growing up to 15 days after treatment with different concentrations of Cr (Table 1), and the control plants showed the most growth. Between days 15 and 29, growth stabilized in plants grown under different Cr concentrations. Only the control plants continued to grow. At S2, the control plants were 20% higher, while growth in those receiving the Cr treatments was between 4% and 7% higher than S0. The symptoms of toxicity were barely visible in plants treated with different concentrations of Zn and Cd. In plants treated with the highest metal concentrations, the lower leaves dried first but young leaves did not show leaf rolling, as was observed in the leaves of plants treated with Cr. The effect of Cr was more evident. By day 15, plants treated with the highest metal concentrations showed signs of toxicity with dry lower leaves. At day 29, plants treated with the lowest metal concentration had three dry leaves. Plants receiving the T3 and T4 treatments were the first to have dry leaves, and their youngest leaves were smaller than those of the control, and they were also rolled up. Table 1. Height of the plants of barley at the beginning of treatment (S0) with different concentrations of Zn, Cd y Cr , and sampling 15 days (S1) and 29 days (S2) after treatment. Figure 1. Effect of different treatment of Zn, Cd and Cr on the growth (a) and the dry weights stem/root rates (b) of barley plants. The vertical bar represents the LSD value at p = 0.05 for metal × treatment interaction. Cd had the lowest root biomass. This effect is more evident in plants treated with Cr. 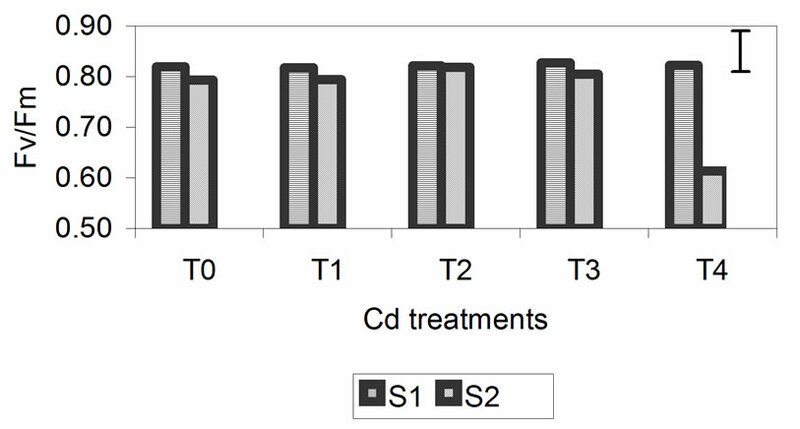 In these plants, the ratio between stem and root DW was significantly greater than that in plants treated with Zn and Cd, and these differences increased progressively with increasing metal concentration (Figure 1(b)). Table 2. Concentration of Zn, Cd and Cr in stems, roots and soil of barley plants treated with different concentrations of these three metals. in various parts of the plant increased progressively with increasing concentrations of the metal applied. The metal concentrations were lowest in the controls and highest at concentrations of 300 mM, 50 mM and 3 mM for the T4 treatments of Zn, Cd and Cr, respectively. The differences between these two treatments (T0 and T4) were significant for the three metals studied. The differences observed between the intermediate treatments were not significant. For all Zn, Cd and Cr treatments, the amount of metal that accumulated in the roots was greater than that in the stem. In plants treated with Zn, the average amount of metal that accumulated in the roots was fivefold greater than in the stem. 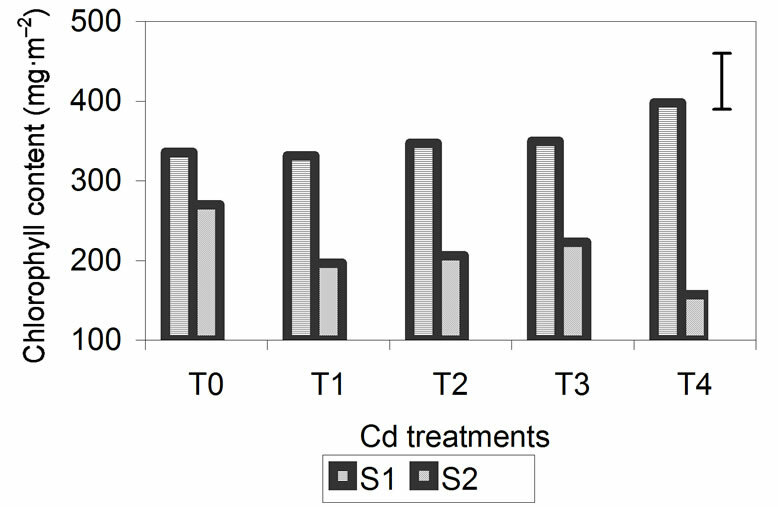 In plants treated with Cd, the average metal accumulation was sixfold greater in the root compared with the stem, and in plants treated with Cr, it was eightfold greater. 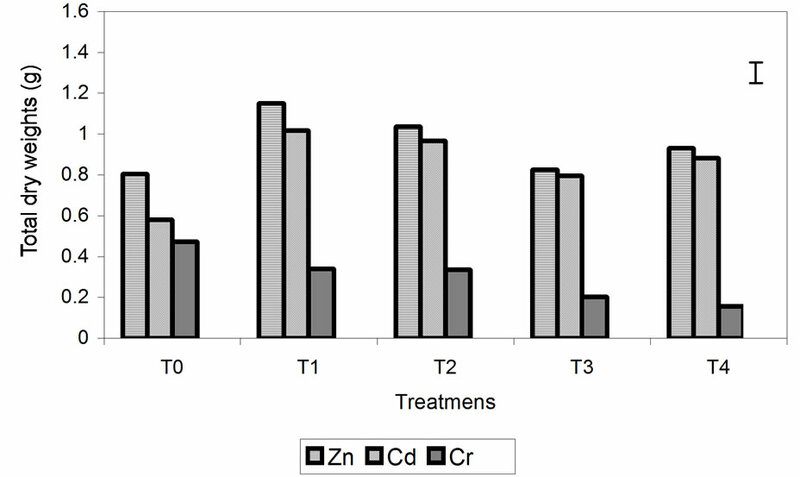 For the Zn and Cd treatments, the amount of metal that remained in the soil was greater than the amount accumulated in the root, although these differences were not statistically significant. In contrast, the quantity of metal remaining in the soil after the Cr treatments was significantly lower than the amount accumulated in the roots and much less than the amount accumulated in the aerial parts of the plant (Table 2). These results indicate that the plants took up the majority of Cr that was applied, while in the Zn and Cd treatments, the amount of metal remaining in the soil was greater than that accumulated by the plants. Figure 2. 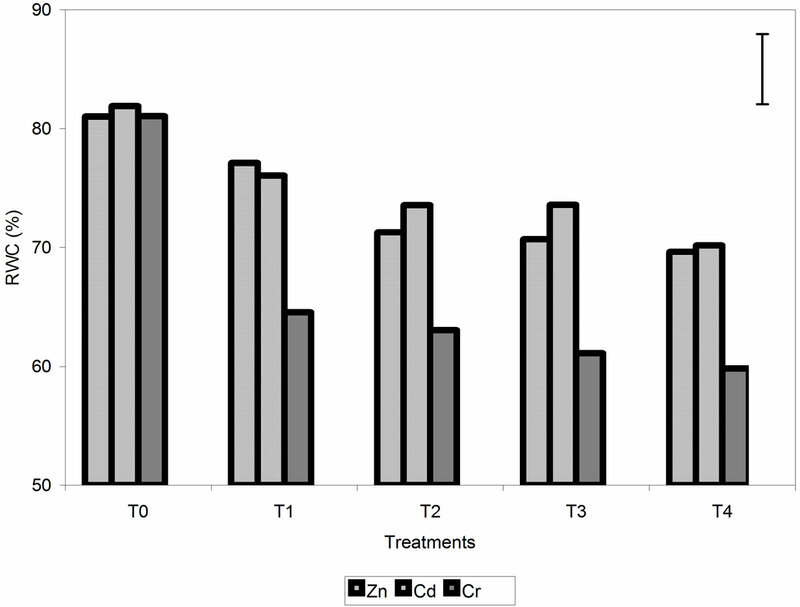 Effect of different treatments of Zn, Cd and Cr on the relative water content of barley plants. The vertical bar represents the LSD value at p = 0.05 for metal × treatment interaction. RWC of plants treated with Zn and Cd. For Cr, the reduction of relative RWC was 26% compared with the control, while for Zn and Cd, it was 14%. Total chlorophyll content is shown in Figure 3. 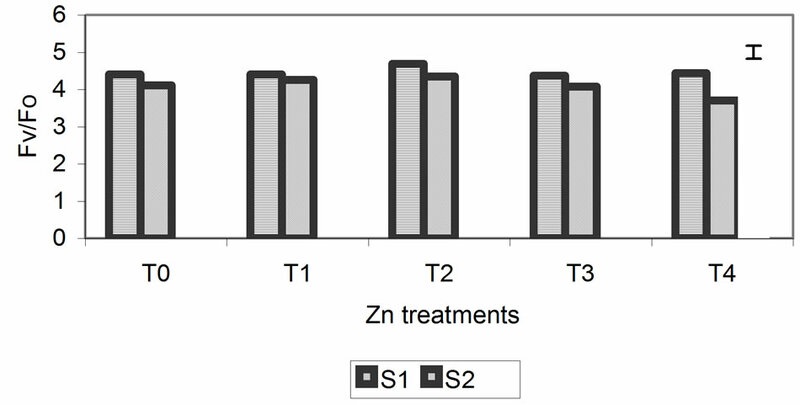 For the three metals, the chlorophyll content of the plants was significantly higher at S1 than at S2, especially for plants treated with Zn and Cd. In these treatments, the effect of the metals during plant growth is most pronounced at 29 days. In plants treated with Zn and Cd, the chlorophyll content at S1 increased as the concentration of added metal increased. Chlorophyll content was lowest in the control plants and highest in plants treated with higher metal concentrations. During the S2, chlorophyll increased in the plants grown with the lowest metal concentrations and decreased significantly in plants treated with the highest concentrations. 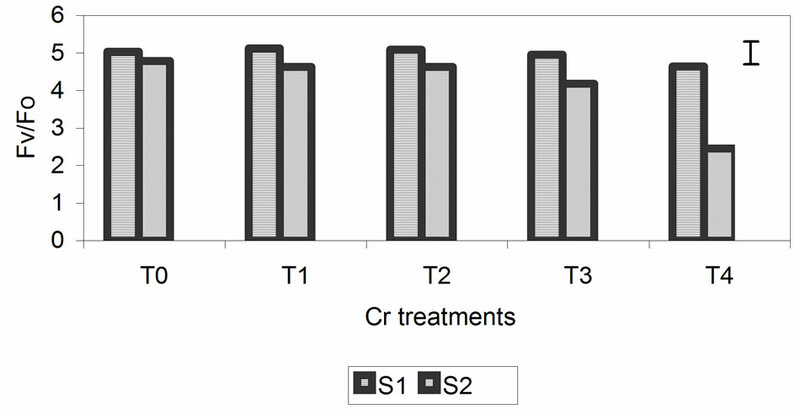 In plants treated with Cr, chlorophyll content was also higher at S1 than at S2 (Figure 3), but there were less differences between the two sampling dates. In terms of metal content, from T1 upward, chlorophyll content decreased progressively between the two sampling events, with the lowest levels being observed in plants treated with the highest metal concentrations. 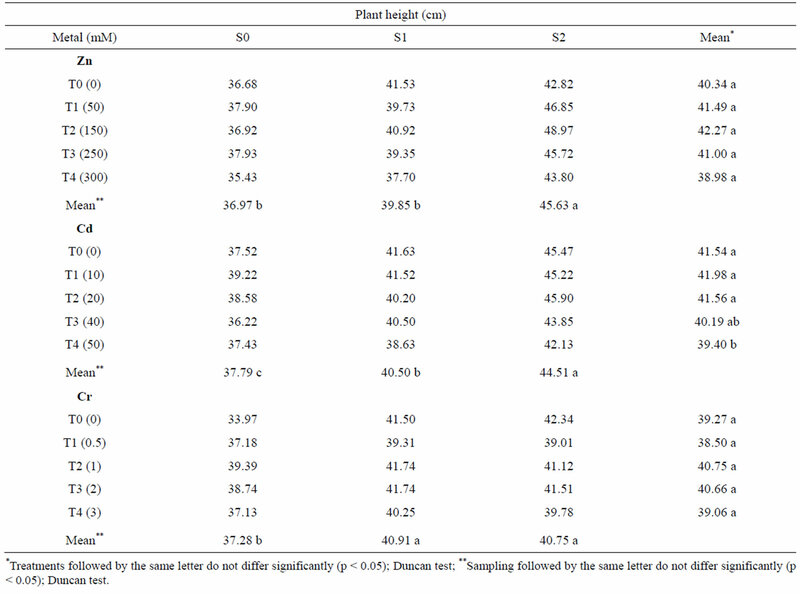 The data obtained for Fv/Fm are presented in Figure 4. The photochemical efficiency of PSII in dark-adapted plants with the PSII fully open is expressed as the rate of Fv/Fm. 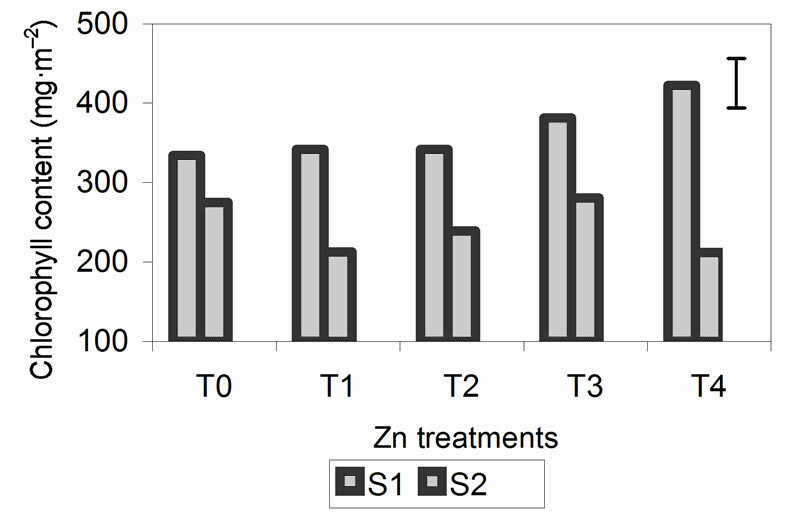 This rate was not significantly affected in plants treated with different concentrations of Zn. After 29 days, the decrease in Fv/Fm for plants treated with concentrations of 300 mM was greater but was only 2% compared with the control. In treatments T3 and T4 for Cd and Cr, the rate of Fv/Fm begins to decrease, but the only significant decrease was found for the highest metal concentrations, specifically, 50 mM for Cd and 3 mM for Cr, after 29 days. For Cd, this decrease was 23% compared with the control, and for Cr, it was 29% compared with the control. These results indicate that the reactive centers of PSII were damaged at higher metal concentrations, especially in the Cd and Cr treatments in which the decrease was more notable. The proportion of chlorophyll fluorescence (Fv/Fo) is a good indicator of change in the photosynthetic quantum conversion rate, and under our experimental conditions, it was more sensitive to the Zn, Cd and Cr treatments. Values of Fv/Fo decreased progressively, with the greatest differences (relative to the control) being observed at the highest metal concentrations at 29 days (Figure 5). 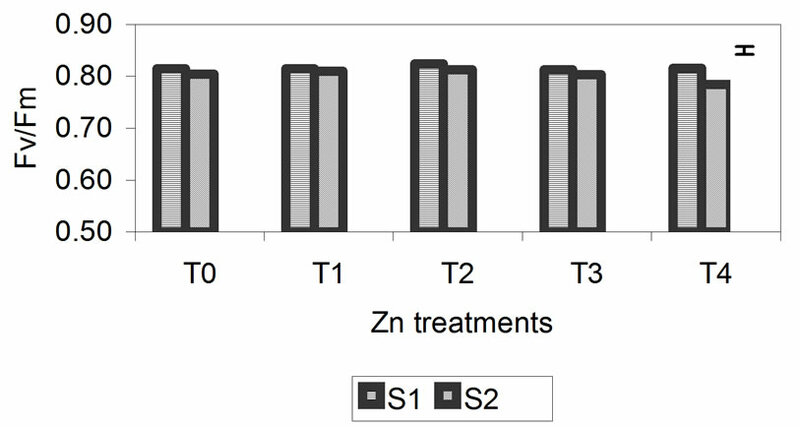 For the Zn treatment, smaller differences of 10% compared with the control were observed. The differences were 32% and 49% for the Cd and Cr treatments, respectively. For both parameters, the differences between samples were significant only for the highest metal concentrations. The correlation between chlorophyll content and Fv/Fm was high (r = 0.52, p < 0.01). Figure 3. 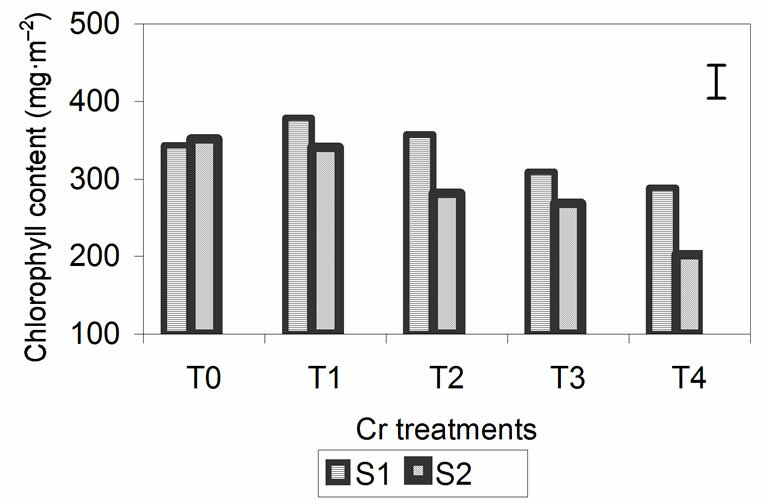 Effect of different treatments of Zn, Cd and Cr on the Chlorophyll contentin the leaves of barley 15 days (S1) and 29 days (S2) after treatment. The vertical bars represents the LSD value at p = 0.05 for treatment × sampling interaction. Figure 4. Effect of different treatments of Zn, Cd and Cr on the Fv/Fm in the leaves of barley sampling 15 days (S1) and 29 days (S2) after treatment. The vertical bars represents the LSD value at p = 0.05 for treatment × sampling interaction. results are in agreement with those obtained for Lolium perenne treated with different concentrations of Cr . This differential effect probably occurs because the aerial part continues to grow while the roots have already ceased growing, due to the treatment with metal. Figure 5. Effect of different treatments of Zn, Cd and Cr on the Fv/Fo in the leaves of barley sampling 15 days (S1) and 29 days (S2) after treatment. The vertical bars represents the LSD value at p = 0.05 for treatment × sampling interaction. slows, and the plants die. The highest accumulation of metals in roots has been found in other crops, such as tobacco  and rice [11,29]. These authors concluded that translocation of the Cd from the root to the stem occurs through the processes of chelation, compartmenttalization, adsorption and translocation, which are influenced by external concentrations of Cd. The amount of metal accumulated in barley CB502 plants (stem + root) was higher in plants treated with the highest concentrations of Zn (5441 ppm) than in those treated with the highest concentrations of Cr (4695 ppm). Zn-tolerant plants accumulate more of the metal, which did not affect plant survival as it did in plants treated with Cr. These data are consistent with the results obtained by other authors [5,14,21], indicating that increased tolerance leads to increased accumulation of metals in the plant. Therefore, tolerance to metals is a beneficial mechanism for cleaning contaminated soils via phytoremediation. The decrease in RWC was higher in plants treated with Cr (26%) than in those treated with Zn and Cd (14%) (Figure 2). For chlorophyll content (Figure 3) and Fv/Fm (Figure 4), the effect of the metal was more pronounced at the second sampling event, especially for treatment T4. With respect to chlorophyll content, the toxic effects of Cd and Cr both caused a decrease of 42% compared with the control, while Zn caused a decrease of 23%. With respect to Fv/Fm, the decrease was 2%, 23% and 29% for Zn, Cd and Cr, respectively (Figures 3 and 4). The decrease in RWC may be due to accelerated leaf senescence, and the reduction of RWC in the leaves can cause important chemical changes in photosynthesis, as observed by Vassilev et al. [30,31] in barley plants treated with Cd. Similar results were obtained for Lolium after treatment with different concentrations of Cr. RWC, water potential and transpiration decreased as the metal concentration and the treatment time increased [25,32], indicating that plants that have suffered metal-induced stress regulate water loss through transpiration. The decrease in chlorophyll content with the application of high metal concentrations suggests that metals affect chlorophyll synthesis, altering the activity of enzymes involved in its synthesis, as has been observed in grasses treated with Cr  In wheat treated with high concentrations of Cd , chlorophyll content, Fv/Fm and photosynthesis decreased, which is in agreement with our results. In our study, there was a high correlation between chlorophyll content and Fv/Fm, indicating that the stress produced by metals reduces the growth of plants, due to a reduction in chlorophyll content and the consequent inhibition of photosynthesis. In summary, under our experimental conditions, barley 502 is more tolerant to Zn and Cd than to Cr. The accumulated amount of Zn and Cd allowed the plants to continue their metabolic functions, while the Cr-treated plants were more affected by taking up the metal, which caused a greater reduction in their growth, water status and chlorophyll content. This work has been supported by Programme EIADES (www.eiades.org) S2009/AMB-1478 from Consejería de Educación, Comunidad de Madrid. Chaney, R.L. (1983) Plant uptake of inorganic waste constituents. In: Parr, J.F., Marsch, P.B. and Kla, J.S., Eds., Land treatment of inorganic wastes, Noyes Data, Park Ridge, 50-76. Clarke, J.M., Norvell, W.A., Clarke, F.R. and Buckley, W.T. (2002) Concentration of cadmium and other elements in the grain of near-isogenic durum lines. Canadian Journal of Plant Science, 82, 27-33. Morina, F., Jovanovic, L., Mojovic, M., Vidovic, M., Pankovic, D. and Jovanovic, S.V. (2010) Zinc-induced oxidative stress in Verbascum thapsus is caused by an accumulation of reactive oxygen species and quinhydrone in the cell wall. Physiologia Plantarum, 140, 209-224. Adriano, D. (2001) Cadmium. In: Adriano, D.C., Ed., Trace elements in Terrestrial Environments: biogeochemistry, Biavailability and risks of metals. Springer-Verlag, New York, 264-314. González, A. (2009) Aplicación del medidor portátil de clorofila en programas de mejora de trigo y cebada. Agroecología, 4, 111-116. Haag-Kerwer, A., Schäfer, H.J., Heiss, S., Walter, C. and Rausch, T. (1999) Cadmium exposure in Brassica juncea causes a decline in transpiration rate and leaf expansion without effect on photosynthesis. Journal of Experimental Botany, 50, 1827-1835.